"I thank God every day that I have been permitted to experience the reality of the image of God in me. Had that not been so, I would be a bitter enemy of Christianity and of the church. Thanks to this act of grace, my life has meaning and my inner eye was opened to the beauty and grandeur of dogma. No matter what the world thinks of religious experience, the one who has it possesses a great treasure, a source of life, meaning, and beauty, and that has given a new splendor to the world and to mankind. He has a living faith." --C.G. 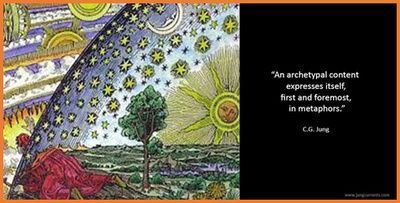 Jung, Word and Image. "I am not addressing myself to the happy possessors of faith, but to those many people for whom the light has gone out, the mystery has faded, and God is dead. For most of them there is no going back, and one does not know either whether going back is the better way. To gain an understanding of religious matters, probably all that is left us today is the psychological approach. That is why I take these thought-forms that have become historically fixed, try to melt them down again and pour them into molds of immediate experience." 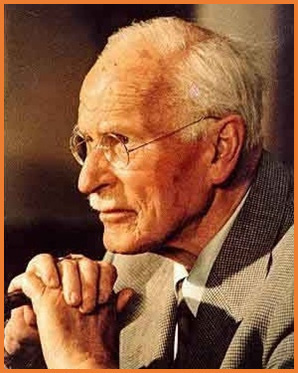 Carl Jung was a Swiss doctor and psychiatrist but also a guru and a shaman, so to speak. 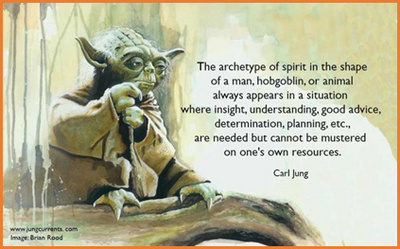 He is best known for his theory on symbols and archetypes. He accepted Christian symbolism and dogma even though the religious symbols in his dreams were somewhat different. He was both introverted and intuitive and given to visions and dreams which he experienced as profoundly real. While these imaginal experiences impacted his youthful psychic life, he had no context for understanding them. He was unable at first to relate to the structures in Christian ritual and dogma until his university studies. Then he was influenced by Kant and Freud and came to view the objective psyche as the source of religious experience. He understood the symbols in the myths and religions of the world to be projections from this source. Of course to speak of religion is to speak of the God-image. His was not the caricature of the Old Man resembling Santa Claus on a cloud in the sky, a sort of policeman of the universe; his God-image was far more complex than that. As far as Jung is concerned, there are six stages in the transformation of the God-image in the western psyche and they all mark advances in consciousness. The six stages are 1) animism 2) matriarchy, 3) hierarchical polytheism, 4) tribal monotheism, 5) universal monotheism and 6) individuation or the discovery of the psyche. All six stages exist as levels in the unconscious. 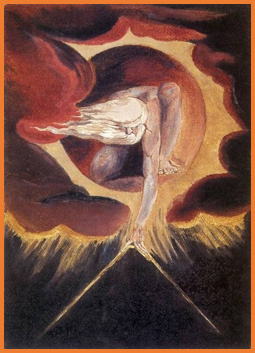 The six stages can be uncovered in a Jungian dream analysis, with the most recent developments in the God-image being experienced first and the original level, being experienced further down the road. Students of Jungian thought are not necessarily churchgoers, but if they are they tend to be members of Unitarian, Quaker, and Roman Catholic congregations. A number of them are Spiritual Directors. They can even be found in Islamic Sufi orders, Buddhist gatherings and in Jewish temples. Jungians are indeed universalists, because archetypes are universal and the collective unconscious feeds all people like an underground stream. Jungian psychology postulates that dreams and visions, and fairy tales, myths and rituals come from a place deep inside of us all -- a level of the psyche or being that connects us as well. Jung named this realm the collective unconscious. He observed universal patterns in the collective unconscious which he called archetypes. Archetypes produce images and experiences of meaning. The young artist's vision in the children's story can be seen as arising from the archetypes of the Great Father and the Great Mother, two of many archetypes Jung identified. 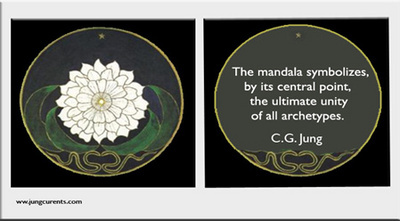 Jung observed a central and unifying archetype in the collective unconscious. This he called the Self which is the God Archetype and the images and experiences to which it gives birth are the meaning-laden God-images of humanity: Temples, cathedrals, mandalas, castles, cities, magical fish, birds and land animals and forests and trees are among the Self’s symbols that appear in dreams. A symbol such as these will be a true expression of the archetype if it engenders a sense of awe in the dreamer upon dream recall. One of the wonderful things about Jungian psychology is its discovery of this new God-image undergirding our diversity as Humanists, Christians, Buddhists. We all have dreams. Light is one of the manifestations of the activated Self archetype in dreams and waking dreams or visions, So is a disembodied voice that speaks with a spiritual authority. Some Jungians have speculated that Paul's blinding vision of unearthly light on the Road to Damascus was an activation of the Self archetype. This new God-image refers to the psychological level which understands religious symbolism as the vocabulary of images of the objective psyche. Jung recognized that the God archetype had the potential to overwhelm an individual if it was experienced directly. An interesting story that illustrates the danger comes from the Greek Orthodox tradition: During the funeral procession of the Virgin Mary someone touched the bier and was either injured or died just like in the Old Testament when somebody touched the Ark of the Covenant when it was being carried in a procession. The theological connection is the understanding that Mary is the ark of the New Covenant. She is called the Theotokos, which means God-bearer in Greek. From a Jungian perspective religious symbols such as these reveal the awesome power of the central archetype and the need for protection from direct encounter for most ordinary people. Religious symbols can be seen as step-down transformers that contain and control the power of the raw archetype. Jung believed the next two thousand years would be a time of increasing awareness in the individual of the God center as it lives within each of us. He also felt we were developing a capacity to relate to it directly without being overwhelmed. In Jungian psychology dreams’ analysis over time provides access to immediate religious experience are therefore deeply meaningful. Via dreams one begins to see the archetypes. At times one will dream the dreams of a people, archetypal dreams, not just dreams of one's own personal life. They come from the collective unconscious which points to something greater than the individual self. Via dreams one witnesses God's progressive incarnation since God is transcendent expressing Him/Herself via the God-image. Christian Jungians believe that Christ and His life are the first expression of the progressing God-image on both the outside and the inside in an individual human being. Jungians feel they help give God a place in human affairs by becoming more conscious. Partly they become more conscious through acknowledging and withdrawing projections. Through their commitment to making the unconscious conscious, they believe they are helping God to become more human as they in turn are coming into an awareness of their divinity. Jungians write down their dreams. They work with their dreams, associating to the dream images and amplifying them with contents from world religions, myths, fairy tales, and classical works of art and literature. They spend time in nature and cathedrals and in other sacred places and they create sacred spaces. They may go on pilgrimages and keep the Sabbath. Jungians may attend religious services of their own and other traditions, recognizing the universal archetypes beneath their culturally colored expressions. They honor God wherever they find God and in many ways they experience God as the Holy Spirit. As one turns a loving face to the unconscious with its central God archetype, one is blessed with meaningful dreams and synchronicities. 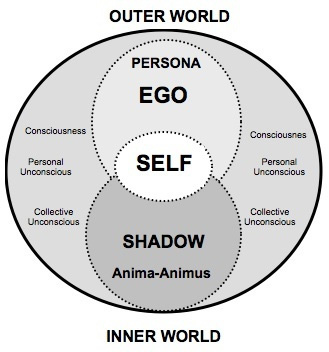 In owning one’s own shadow or dark sides as one sees them revealed in dreams (owning them so as not to project them or act them out) Jungians believe they are doing a moral task that is making the world a better place. In fact, engaging with the new God-image as a conscious way of life involves attention to and development of the interior life. When one embraces the Jungian paradigm, one is then able to better understand, and in a meaningful way, collective religious expressions. The other option is to make religion a caricature and remain at the surface superficial level of the spiritual life. 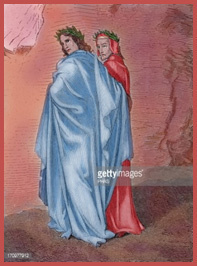 That way lies confusion and perdition, the road Dante found himself on at the beginning of his fateful journey into hell which can itself be interpreted as a Jungian archetype.